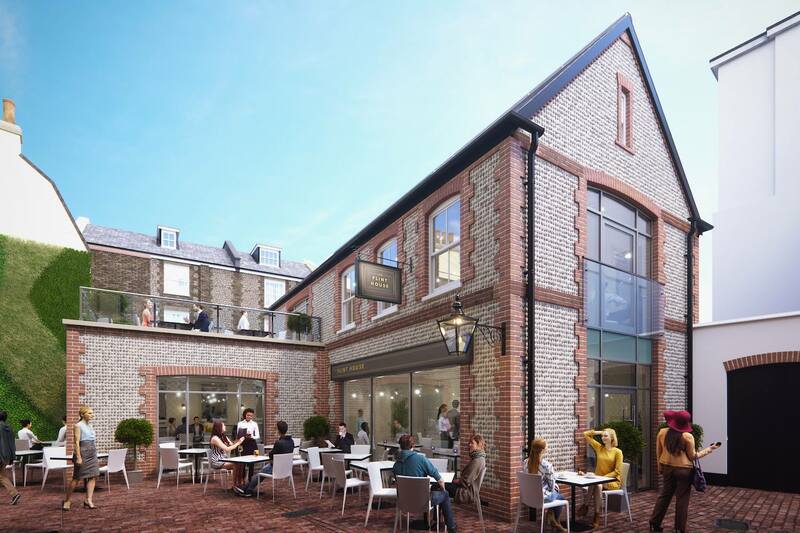 Brighton’s renowned Gingerman Restaurant Group will open their eagerly anticipated new restaurant concept, The Flint House, in the heart of Brighton Lanes next week. Ginger Chef Ben McKellar and wife and business partner Pamela McKellar have been working with architect Morgan Carn and developer Redevco on the design of the beautiful two-storey flint clad building within the newly developed Hanningtons Estate. The Flint House will be a 50-cover restaurant featuring a full-length kitchen bar for counter-style dining, a first-floor cocktail bar and rooftop terrace, adjacent to a beautiful new green wall and overlooking Brighton’s newest Lane. Other local architects, Landivar, have helped create a fashionable, high-end interior finish for the restaurant and bar, which will feature a colour palette of greens, greys and charcoals, fabrics from House of Hackney, lighting from Belgian company Wever & Ducre and creative plant design from Go Botanica. An elegantly inspired menu of snacks and small plates designed to share will include: Sweet & sour aubergine, basil, ricotta, pickled chilli on toast; Chicken thighs, sweet potato, chipotle; Slow roast lamb belly, green sauce, anchovy; Whole grilled prawn, saffron mayo; and Miso mackerel, fennel, pomegranate. A full menu will be available at www.flinthousebrighton.com.